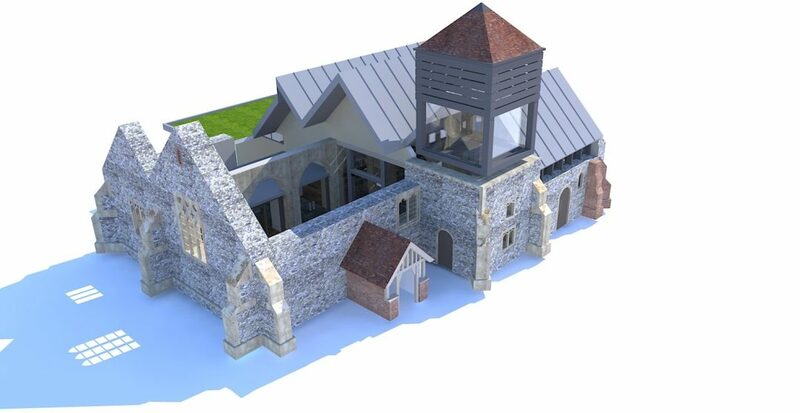 Studio Four Specialist Projects were invited to submit competition designs for the complete re-build of St.Peters Church in Ropley, Hampshire which was subject to an extensive fire in 2014. Option 1 was a more traditional re-build of the church form, but using modern materials internally, this allowed for larger spans and more internal flexibility. The additional accommodation required by the church would then be sited in a contemporary building built from traditional materials to reflect the existing church. This building was to be sited behind the existing church in order to not over-power it, but also framed a new public walkway through the site. Our Southampton office were asked to prepare a feasibility for the replacement of the existing sailing club on Southampton water, adjacent to a public park. The scheme includes the construction of a new entrance concourse towards the front of the site linking the main church building and the Avenue Hall, and extensive internal refurbishment of the Avenue Hall. Studio Four Specialist Projects have undertaken a feasibility study for all saints church in Houghton and have produced designs for a new extension and alterations to the internal arrangement of the church. As part of the development of Brighton Marina, the existing Yacht Club portakabins were to be removed to construct new blocks of flats.